Mitchell was drawn to art, but “growing up just at the time before arts were included as a part of education… at that time I was kind of a freak.” Also, before she suffered polio, she had been more athletic herself than artistic, but once she recovered and realized she would no longer be able to compete with the fastest swimmers or runners, she found her compensation in arts. Mitchell has been deeply influential on fellow musicians in a diverse range of genres, and her work is highly respected by critics. 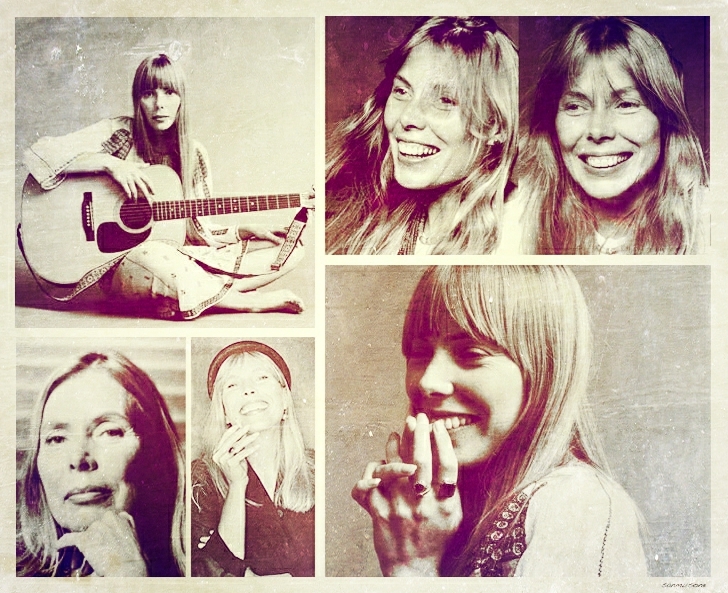 All music said, “When the dust settles, Joni Mitchell may stand as the most important and influential female recording artist of the late 20th century,” and Rolling Stone called her “one of the greatest songwriters ever.” Mitchell’s lyrics have been noted for their developed poetics, addressing social and environmental ideals alongside individual feelings of romantic longing, confusion, disillusion and joy. I said it many times before, I am fan of old times, the times even before my time and Joni is one of those fabulous things from before my time. Starting the day with the sound of her smooth voice and beautiful guitar melodies, just makes the day seem very easy and more bright=) I don’t even notice always the great lyrics behind the voice, but it’s one more reason to love Joni’s music. I agree, she’s one of the greatest artists and I admire her full dedication to her art, she puts all of her into it and you get to know her, as a musician, as a person, as an artist, you listen what she has to say. It wasn’t easy road nor was it very exemplary, considering the rebel moments and smoking from age 9, but that was all necessary for her to find herself and be herself and be as great as she was. She is very familiar to me soul, who doesn’t like to follow standard rules and be defined by social standards. See more about Joni Mitchell on her website, LastFm. Follow her on Twitter and Facebook.